When a bird’s natural plant food has waned or withered away in late winter, a few well-placed feeders can entice a feathered friend to stay nearby. There are four basic types of feeders, but the type of feeder and food it’s filled with will determine which birds will visit. Which do you want in your yard? A tray or platform feeder with low sides and a wide, open base placed one to three feet above the ground will lure ground-feeding birds like juncos, towhees and mourning doves. Grouse and quail may also visit this type of feeder, and these feeders are ideal for offering food to large flocks of birds. Hung from a tree or hook or mounted on a pole, “house” style feeders with seed hoppers and perches on the side will usually entice grosbeaks, cardinals and jays, as well as sparrows and finches. 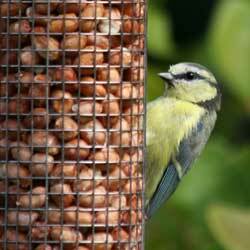 These feeders help keep seed dry and can hold a larger quantity of seed so refills are not as frequent. Long, cylindrical tube feeders suspended in air will bring in an array of small birds, including finches, titmice, nuthatches, siskins, redpolls and chickadees. These feeders may have either mesh-like sides where birds can easily cling, or they may have multiple perches to accommodate more birds. Sock-style feeders are also popular. A cage-like feeder that holds a cake of rich, fatty suet is a bird magnet for woodpeckers, wrens, titmice, nuthatches, titmice, mockingbirds and jays. A standard suet cage can hold just one cake and can be hung from a pole or branch. Larger suet feeders may hold multiple cakes, and some suet feeders are even designed as logs or other shapes to hold suet plugs or balls. Birds will seldom drop or pick out unwanted seeds if you fill your feeder with only one type of seed rather than a generic mix. 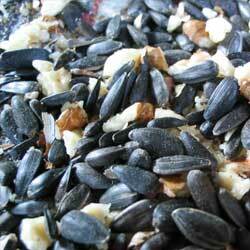 Black oil sunflower seeds are the most widely preferred, though white millet is popular for smaller finches, sparrows and ground-feeding birds. A tube feeder containing Nyjer (thistle) seeds will whet the appetite of goldfinches, siskins or redpolls. Jays, chickadees and juncos love peanuts or cracked corn as a treat in a tray feeder. Suet is another fine treat that offers great calories to keep winter birds healthy. No matter which type of bird feeder you offer or how you fill it, you are sure to enjoy the company of a hungry winter flock. Keep the feeder filled and clean, and the birds will continue to visit all winter long.